I started writing a different post just now. It was about how things aren’t going great at the moment, and how I’ve been feeling under the weather, etc. Those things are true but I realized the way I was writing about them was just bringing me down. I found myself tempted to apologize for said blog post. That’s when I realized I needed to turn it around. So, welcome to my reframed post! I’m not going to ignore or downplay any of the negative stuff. I’m just going to strive to see things in a realistic context and not tune out the positives. Some of the challenges I’m facing right now are the fact that I’m STILL not back to work, I’m dealing with fairly constant pain, car insurance claim issues and about a million other life stressors. I’m coping with these things reasonably well, but it’s getting to be very trying. On a positive note, knitting is still keeping me sane! I’ve got a lot of projects on my plate at the moment but I’m optimistic that I can get everything done. Or at least, I can get close! Pretty cool, right? I posted the “recipe” on my ravelry project page. I’m very happy with how it came out. The next step is to make the eyes, which are also made in two separate pieces and seamed. I’m thinking that instead of knitting them top to bottom like the pattern says, I will knit each piece in the round as a flat or nearly flat circle, then use a three needle bind off around the edges. Then it will just be a matter of knitting some I cord to attach the claws and sewing it all together. I think it’s going to look awesome! I started the car blanket for my FIL. I’m trying something kind of new and am curious to see how it will turn out. I really wanted to make it in log cabin style but I wanted the sections to be squares. 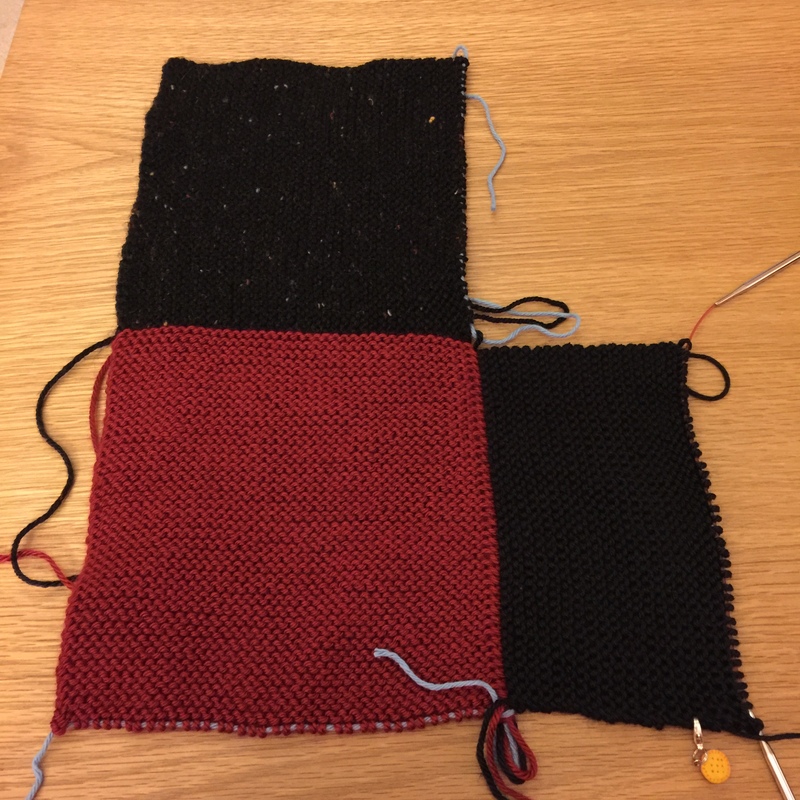 For log cabin knitting, you start with a garter stitch square or rectangle, then rotate it 90 degrees and pick up stitches along the selvedge edge. You knit a new panel from those stitches, then rotate it 90 degrees and pick up more stitches along that edge. Check out Mason Dixon Knitting for the full idea. In any case, you never attach live knitting to another edge, just pick up stitches and knit out. What I wanted to do meant that I would have to attach the end of each garter ridge to a cast on or bound off edge of another square. Well, I couldn’t find information on how to do that anywhere despite tons of searching. The best I could come up with is to use the same technique of knitting edging perpendicularly onto live stitches. So, I decided that instead of binding off each square after finishing it, I’d put the live stitches on waste yarn and knit them together with future panels. I’ve finished about two and a half squares so far but haven’t had to do that yet. We’ll see how it goes! The model is five months old. It fits her fine now, but probably won’t for long as it’s a little snug. It’s a fun, quick knit for anyone looking for an easy gift. I’ve got three more test knits in the works. 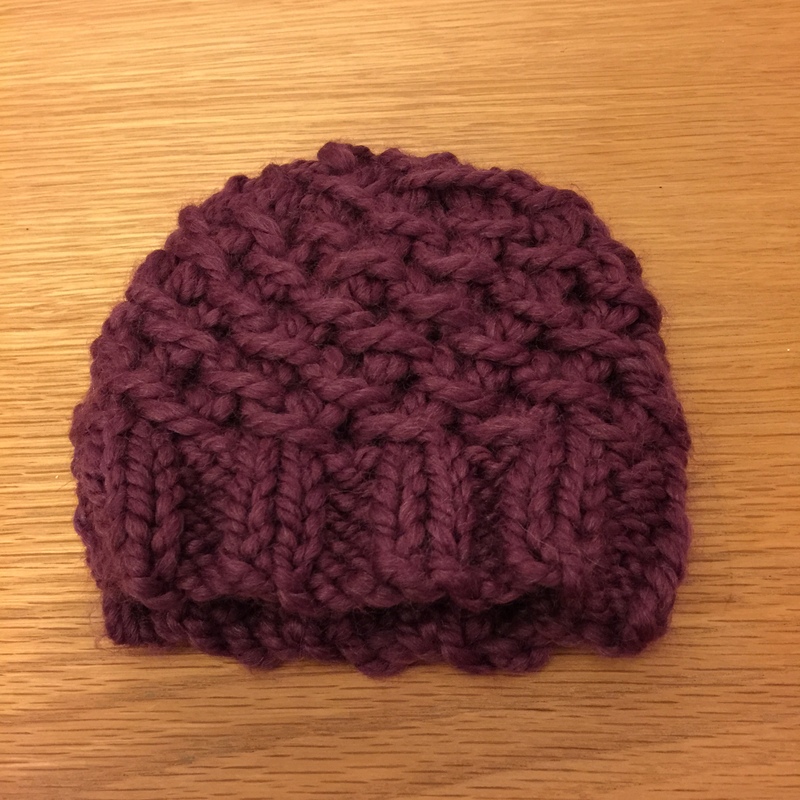 One is a hat that I just finished, but I don’t have good pictures yet. It’s blocking now so I should be able to post about it in a couple of days. One is a hat that I’ll be starting tonight. 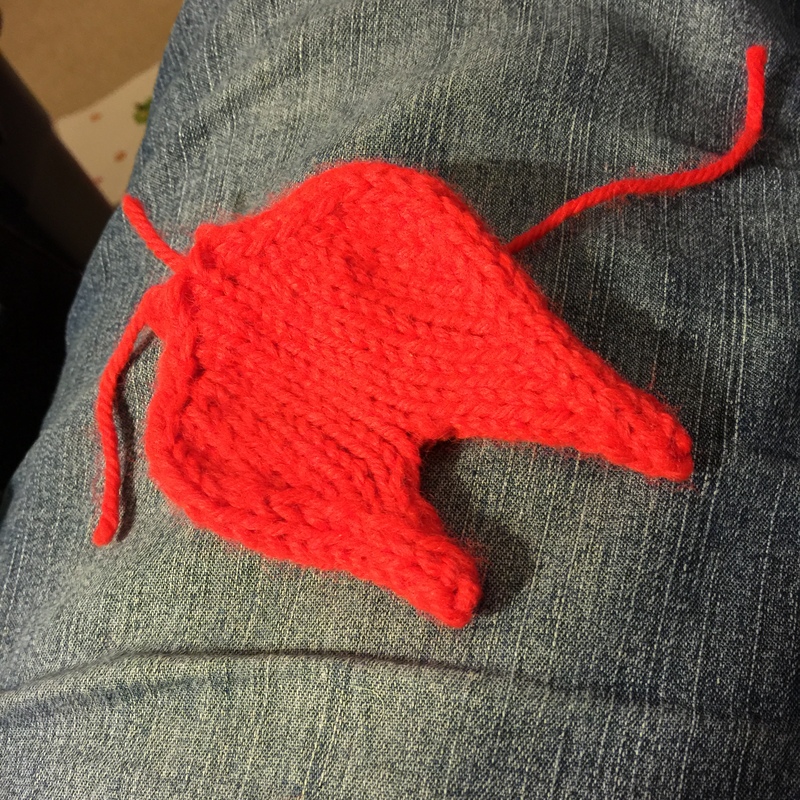 The other isn’t due till January so I am waiting to get some gift knitting out of the way, but it will be my first non-hat test! It’s a kids top. More on that later. Interestingly, I stumbled into doing a commission piece. Some background first: when I was little, my mom made Christmas stockings for the family. Well, my brothers had ones my grandmother made with felt, but my parents and I had knitted ones. 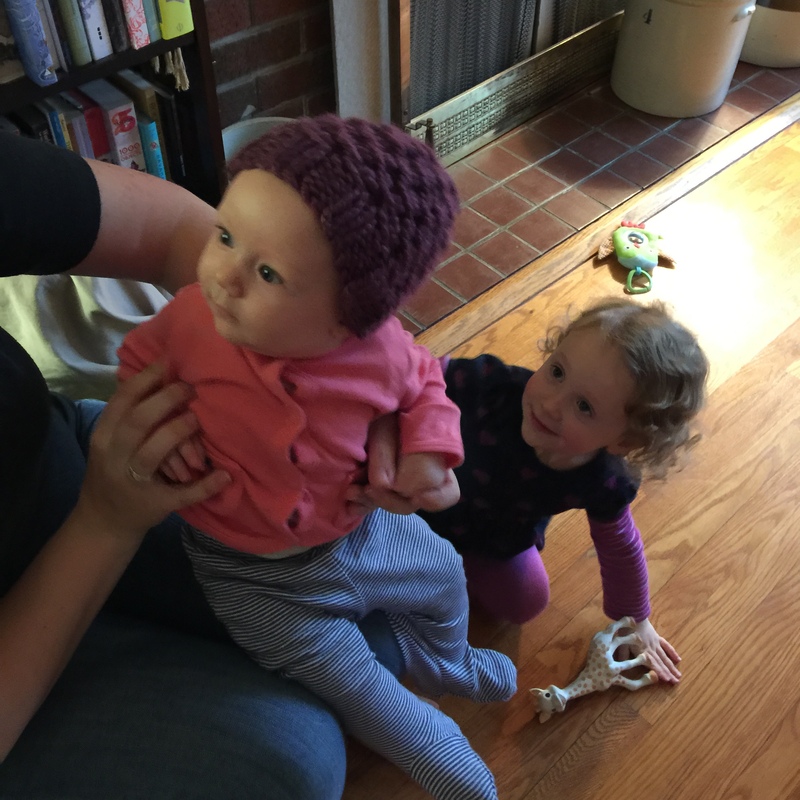 Every once in a while someone would ask her to knit one for their family, so I remember watching her make a number of them through the years. The other day someone on Facebook posted in a group I’m in. She was looking for a knitter to make a stocking very similar to the ones my mom used to make. So, I responded and we talked a bit and I’m going to knit her a stocking! I’m pretty excited because I think it will be fun. I’m getting the pattern and a prototype tomorrow. So, if nothing else, knitting is distracting me from stressing about things I have no control over. I’m doing everything I can to get things back to normal, but it’s so slow going. This is definitely the most prolific stretch of knitting that I’ve ever had! I really like your reframing! Also love how you modified the lobster claw. It looks great! Congrats on the commission. 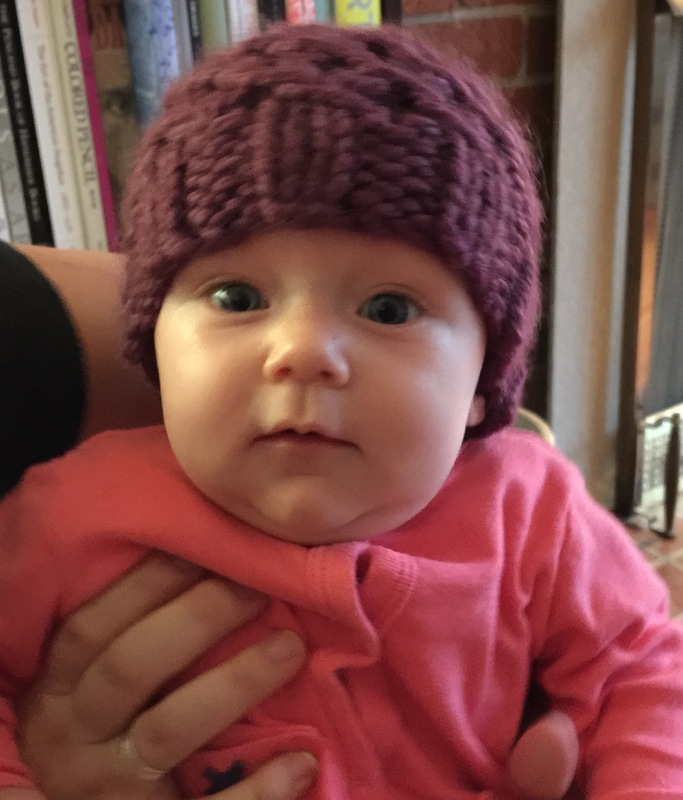 The little hat is so cute on that sweet baby. And you know, if you need to vent to get it out, why the hell not? For me, I have to verbally vent to decompress. Then think of something positive and grab your needles and get clickety clackin’.